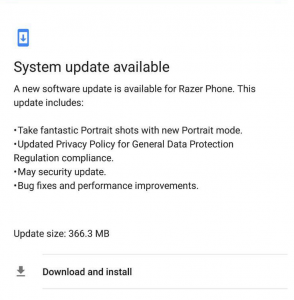 Razer Phone Gets Updated With Portrait Mode & May Security Patch - AndroGuider | One Stop For The Techy You! Razer's CEO Min-Liang Tan promised last year that the Razer Phone's camera would be improved and features such as portrait mode and 60fps video recording would be added by "late Q1". The Razer Phone has received numerous software updates improving the camera quality and the device was recently updated to Oreo 8.1. Razer is now rolling out a new update for the Phone which adds portrait mode, bumps up the security patch level to May, and improves the overall performance. In addition to the portrait mode, there is another feature which isn't noted in the changelog. Razer Phone users will now be able to lock apps into the memory. This feature will prevent users from accidentally wiping an app from the recents pane. 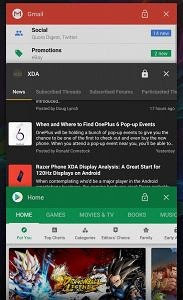 If the 8GB RAM on the Razer Phone gets filled up to capacity, the system will prioritize RAM to the locked apps. The update size is 366MB and the update is rolling out to all Razer Phone users via OTA. You can wait for the update notification to show up, or you can manually pull the update by going to Settings > System > System updates. Razer has also provided fastboot images for those users who are interested in sideloading the update.